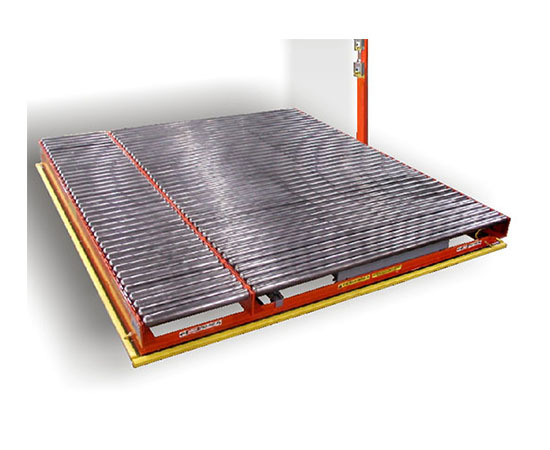 Systec's Shuttle Automatic Car (SAC) can be used at various points within the overall conveyor system. The SAC is primarily used where a break in the conveyor line is required, or a single line may need to deliver to more than one location. It can also be used at the infeed of converting equipment to allow machine opening without interference. Provided with an on-board mast assembly with power disconnect switches, an audible and strobe light warning system for impending conveyor movement. Provides the necessary power to the conveyor for powering the conveyor and shuttle movement. The method of power can be delivered by a hanging cord (restricted by distance of travel, or by a powered festoon cable system.